Space is at a premium in urban centres, and you might not have enough space in your backyard to plant as many vegetables as you like. But have you ever thought of going out into your front yard? 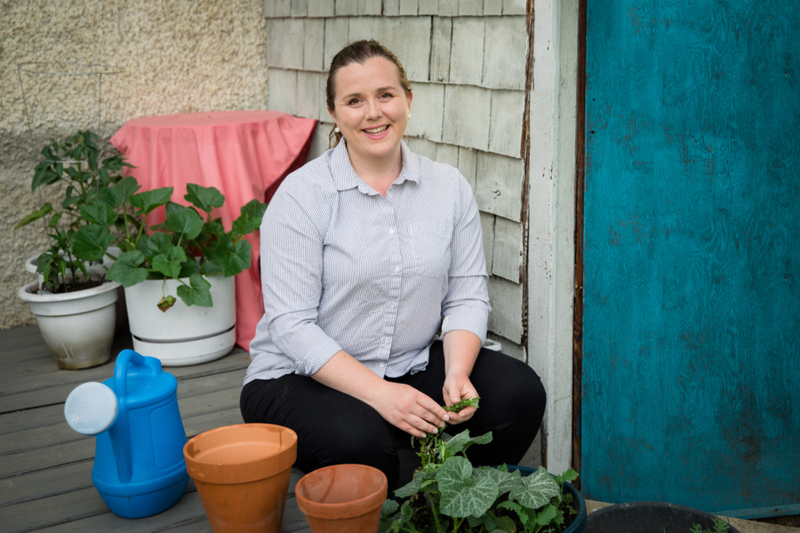 In some neighbourhoods, the front yard space is even larger than the backyard space, and can easily help you double your available gardening space. 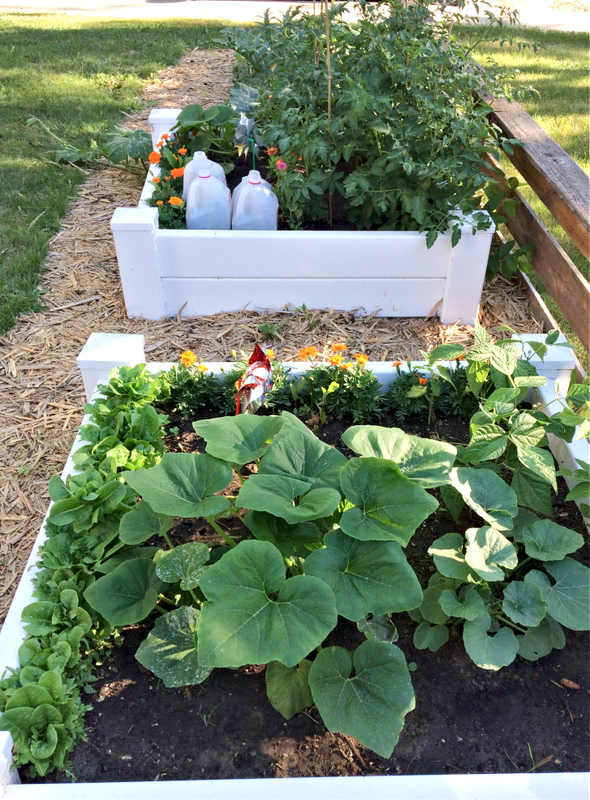 If you’re thinking of starting a front yard vegetable garden, check with your city or municipality that they are allowed, ask for a line locate from your power, energy, or cable company, and start dreaming up your new raised bed vegetable garden! 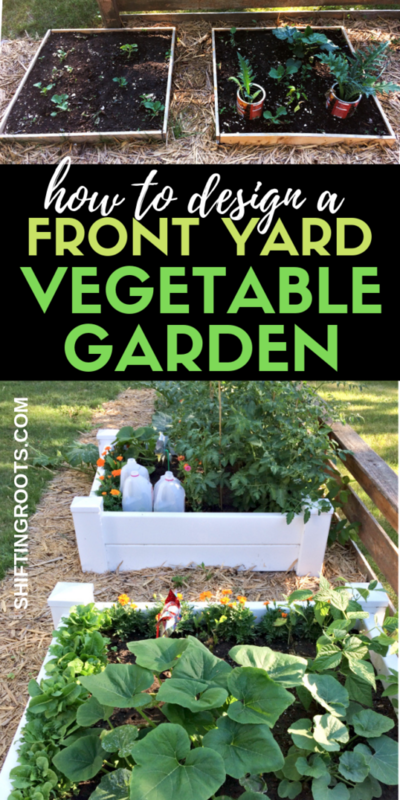 Here’s how I made over part of my front yard into a raised bed vegetable garden. Our front yard was pretty uninspiring, to say the least. 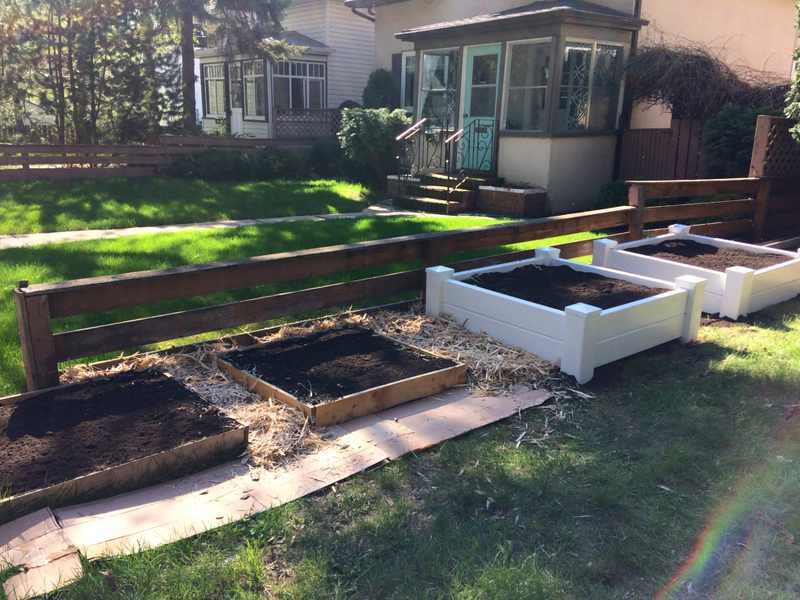 In the previous year my husband constructed these cheap wooden raised beds for me because I could not fit in everything I wanted to plant in the backyard. I had even more plans to expand my vegetable garden, so the dried out potentillas had to go. The potentillas were so overgrown and parts of them were even starting to rot. I’m sure they were beautiful in their time, but if I was going to keep them, they were in desperate need of a good pruning because they didn’t flower very much in the summer. I’m not sure why, but the thought of ordering soil and mulch from a landscaping company seemed really overwhelming to me. However, I knew that this was too big of a project to be dragging bags of the stuff from a big box store back and forth in my truck. However, I went with a friend to one of the larger companies in the city and got it done!! I ordered 1 yard of pine mulch (the cheapest option) and 2 yards of soil with compost and peat already mixed in. I assumed that because compost and peat was already mixed in, that I wouldn’t have to make any further amendments to my soil. While the vegetables in the new soil performed alright, there was a noticeable difference from the ones in the soil that I had been improving with compost and manure for 3 years. 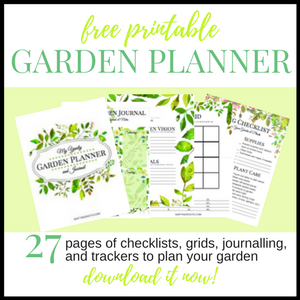 Planting your first vegetable garden? 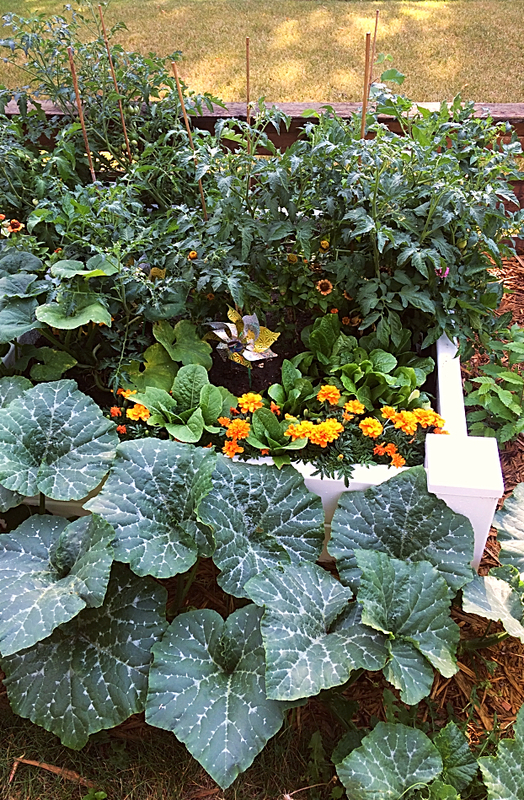 Here’s the 10 easiest vegetables to grow, plus 6 tips I wish I would have known. Though these piles may seem on the small side, it still took me around 9 hours of work to move everything with a wheelbarrow to where it needed to be. Since I don’t have a driveway, I had to get it all done in one day before any of my neighbours complained to the city. If you are in this situation, check the city bylaws to see how long you as a homeowner can leave something like this out on a city street. In my city it’s 24 hours, but in some places it can be as short as 6 or as long as 48. If you need longer, you may have to apply for a permit. The moral of the story? Schedule your delivery for a day when you know you have the entire day to deal with your soil and mulch!! Almost finished our front yard project. 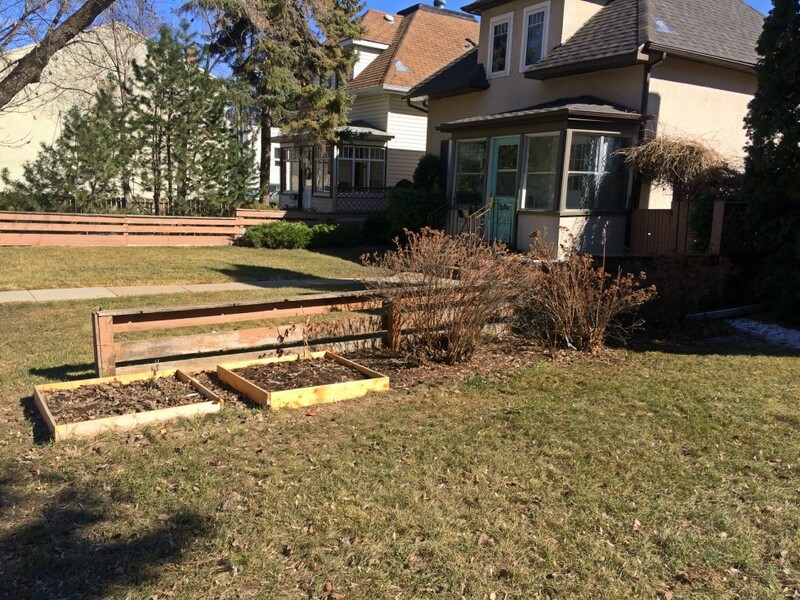 The two wooden raised beds in the front will be upgraded next year! 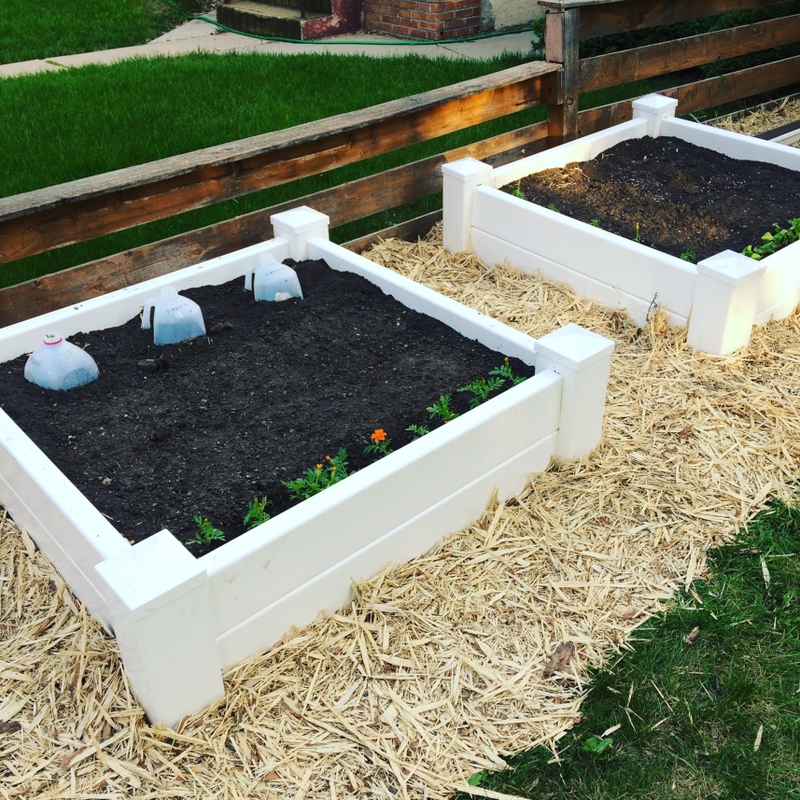 I filled up the raised garden beds with soil, surrounded the area with cardboard, and layered over a 4 inch layer of mulch. Technically, I could have left the grass, but I wanted this project to be as maintenance free and neat looking as I possibly could. I don’t want to risk getting complaints from my neighbours because I am behind on the weeding. The occasional weed will still come through your mulch. However, I can promise you that these weeds are super easy to pick–especially when you compare the amount of weeds you would have otherwise. 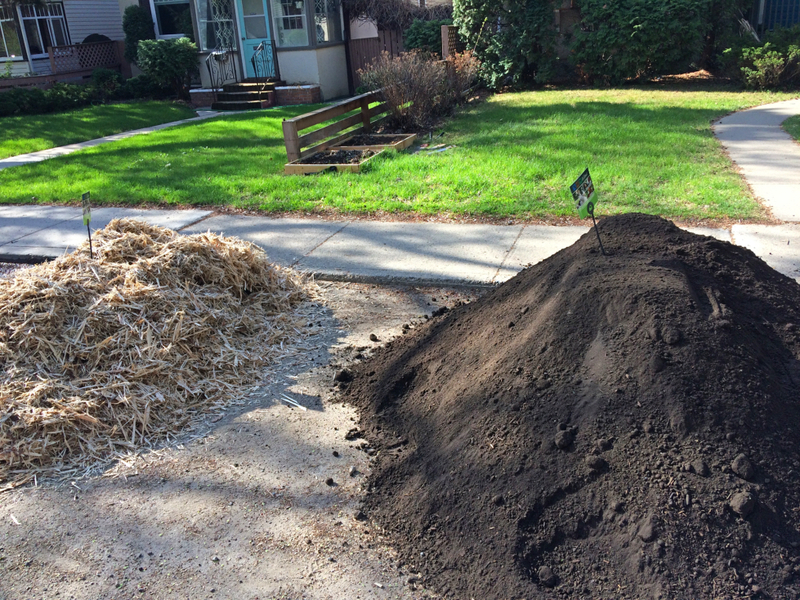 Another thing you should know about mulch is that you’ll have to replenish it every 2-3 years. 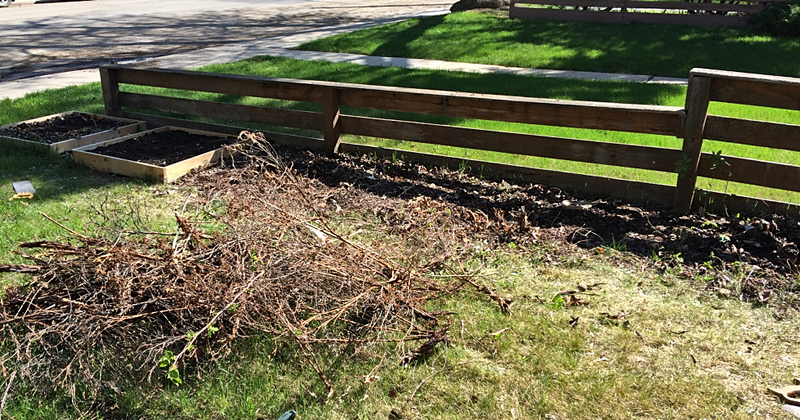 Wooden mulch will decompose over time, making your formerly 4 inch layer not thick enough to suppress weeds. You can use cedar mulch instead if you don’t want to top up your mulch as often. However, cedar tends to be more expensive. If you’re used to traditional rows in a garden, it can seem very strange to switch to this way of planting a garden. But once you try it, you’ll be hooked! 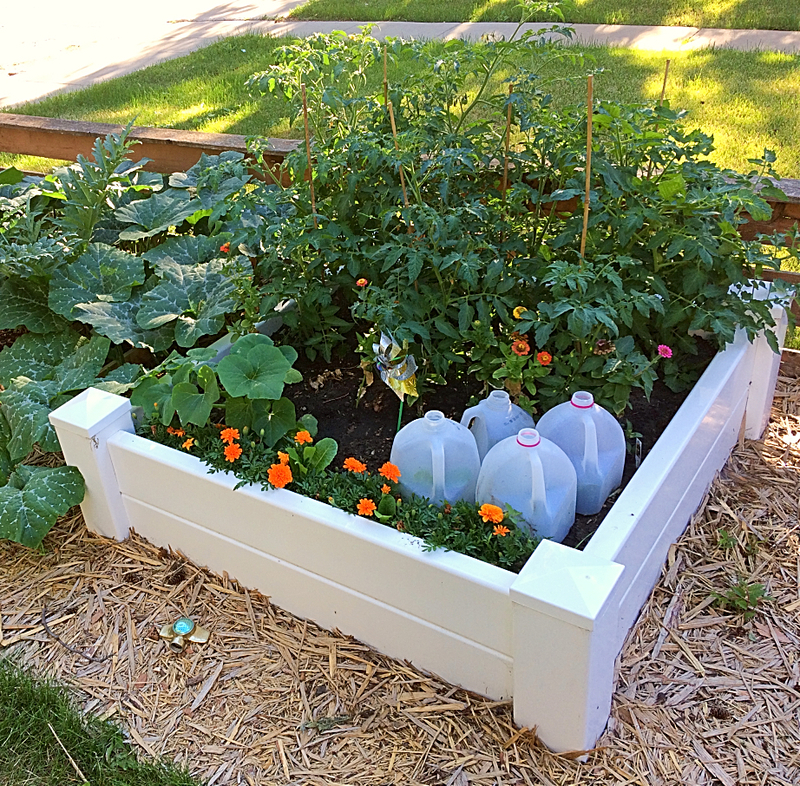 You’ll be able to plant more vegetables in the same space and keep down the weeds much easier. In fact, I found that once I had done the initial major weeding in June, there was barely any weeds after that, and it was easy to simply pull out the few that did manage to come up. In the bed on the right, should not have planted that pepper between the artichokes. I had never grown artichokes before, and had no concept of how tall they would actually get. (3-5 feet!) Needless to say, the pepper did not do well. I also did not realize that butternut squash and watermelon would cross with each other. I was blessed with some lovely mutant squash. What do you get when you cross a butternut with a watermelon? A very weird squash that you really don’t want to eat!! Overall, I was really happy with my front yard vegetable garden. It was easy to keep up with and I would often notice people who were walking by enjoying it. Neighbours would often stop by to chat about the garden, and perfect strangers would stop their walk to ask me questions about the garden if I was outside working on it. I was a bit nervous about possible theft come harvest time, but so far it has not been a problem. In fact, my biggest problem was actually the birds that mercilessly picked at any lettuce, kale, beets, and swiss chard that I planted. Next year I will protect my plants with cloth until they are well established. By late summer, the garden was very productive and my mutant butternut squash/watermelon vines had taken over. 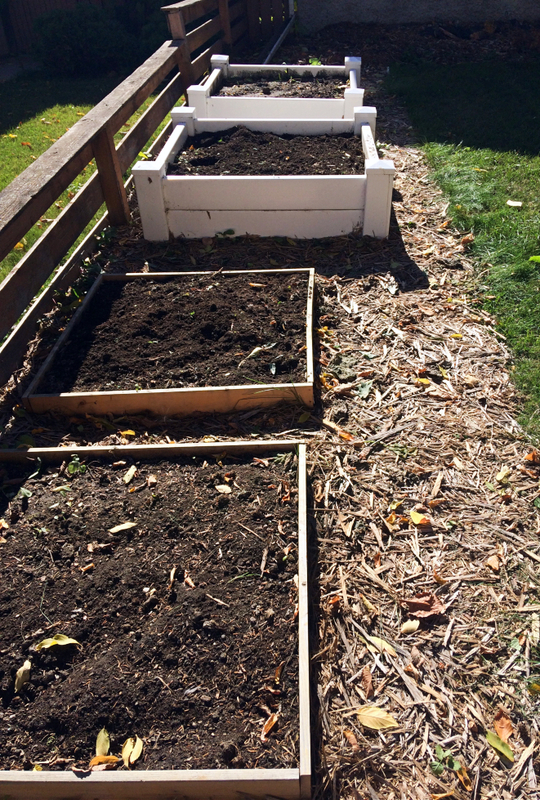 All in all, I’d say my front yard raised bed vegetable garden project was a huge success! Mel Bartholomew’s 3rd Edition Square Foot Gardening Book. The Seeding Square, on the product site, or on Amazon. 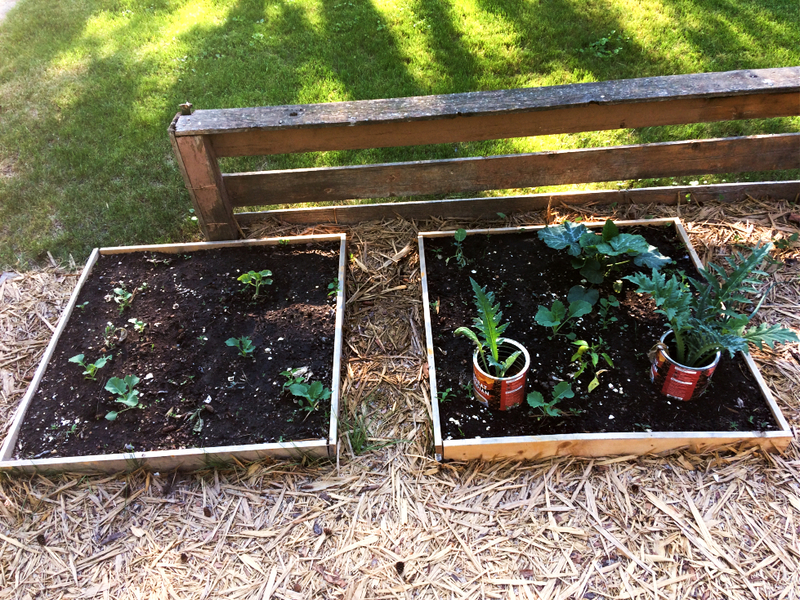 Or just a basic wooden raised bed. P.S. 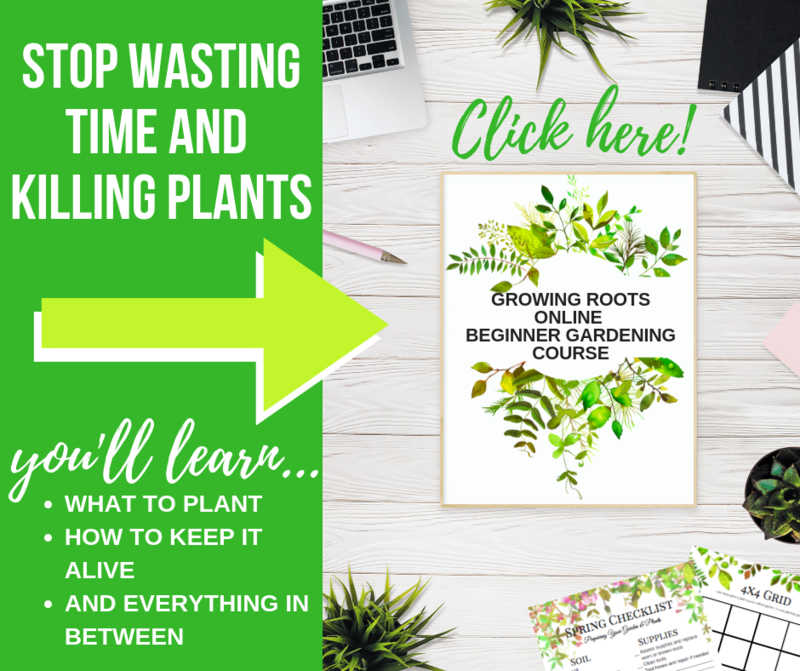 If you’re a new gardener and looking for hold-your-hand-virtual gardening advice, my new online gardening course is for you! 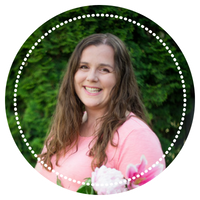 Welcome to Week One of the 6 Week Yard Transformation Challenge, hosted by my friend Nat at Simple Family-Crazy Life. Nat is starting her second round of the challenge for those of us in colder climates. You can check out her front yard in the first round. The snow has just barely finished melting here so this week I’ll be showing you all the projects I hope to accomplish. Will I finish them all? Probably not. But this six week challenge is good motivation to get as many as I can done.